The year-end is a busy time for most accounting departments. 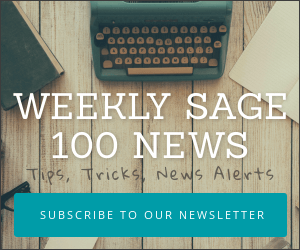 Whether this is your first year-end close with Sage 100 or your 2oth you'll be happy to know that there's a Sage 100 Year-End center to help answer questions. This website, maintained by Sage, offers links to frequently asked questions, product and year-end updates as well as late breaking tax regulations. Even though it may seem early to begin thinking of year-end this is a good time to bookmark the site.